For us here at Happy Kava Brand though, the effects of this Ashwagandha Kava Tincture Blend is one of our personal favorites. Both stimulating and relaxing at the same time, with added clarity in thought, this is a great pick me up to help get me through difficult and stressful days. 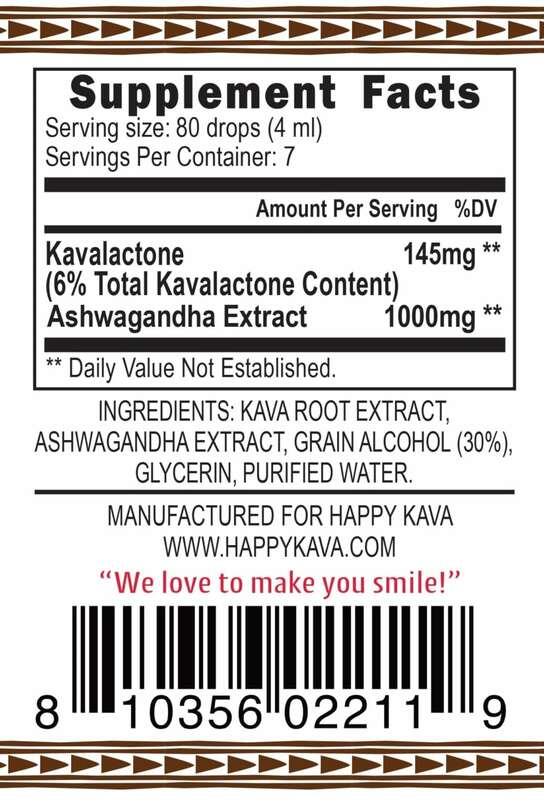 This is the Happy Kava Ashwagandha Tincture Blend. Happy Kava Brand has expertly formulated a line of Kava Tinctures that take the best of organic or wildcrafted herbs. There are a number of herbs that have made it into the mainstream. Even those not super familiar with different herbal products have now probably at least heard of the 12 herbs we have chosen to blend with our Noble Kava Root with the Happy Kavalactone lineup. Kava can help promote feelings of well being and calmness. But what if you want to kick your Kava up a notch, and accentuate it with something equally as famous for balancing a system and providing a sense of well being and balance? This is where Ashwagandha comes in. Many herbal blends combine only a few milligrams of each herbal ingredient in their formulations, making it nearly impossible to feel the effects of any of them. Herbs need to be concentrated, and that is exactly what Happy Kava Brand has accomplished with this Ginseng Tincture Blend. In a referenced and informative article called “Withania somnifera – Ashwagandha” on Entheology, there is a great deal of historical data regarding this plant’s wide and varied uses. Said to be psychoactive in the right doses, the article also states this; “The liquid extract of the root has anti-stress effects similar to those of ginseng.” This is absolutely perfect when it comes to making a Kava Blend with Ashwagandha, as it’s a match made in heaven. Something equally as curious about this root, is what the above article goes on to say; “Sushruta, the Indian physician and co-founder of the Ayurvedic system, hailed the root as rasayana, an alchemical elixir, and as a vajikarana, an aphrodisiac, sometimes used in combination with Cannabis sativa. For this reason, ashwangandha was employed in sexual magic and Tantric rituals.” That’s quite high praise coming from a person who staked his good name and reputation on the herbal remedies he endorsed. No toxic side effects have reported to date (Grahndi et al. 1994). We add the equivalent of one-half teaspoon of Ashwagandha root into every serving of this tincture. We don’t add any other filler herbs that may or may not actually have the energizing and balancing properties that Ashwagandha has. 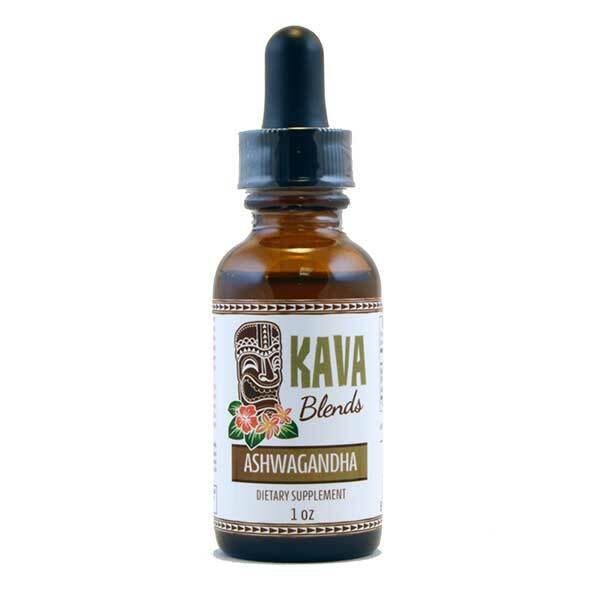 All we have in this award winning Ashwagandha Kava Tincture Blend tincture is pure Noble Kava root with a 2-4-6 or 4-2-6 Kavalactone lineup, and pure Ashwagandha root. Directions: Shake well!! 80 drops twice daily. Do not exceed the recommended dosage. Maximum period of daily use: 3 months. Use may resume for 3 months after a 2-week break. *These statements have not been evaluated by the Food and Drug Administration. 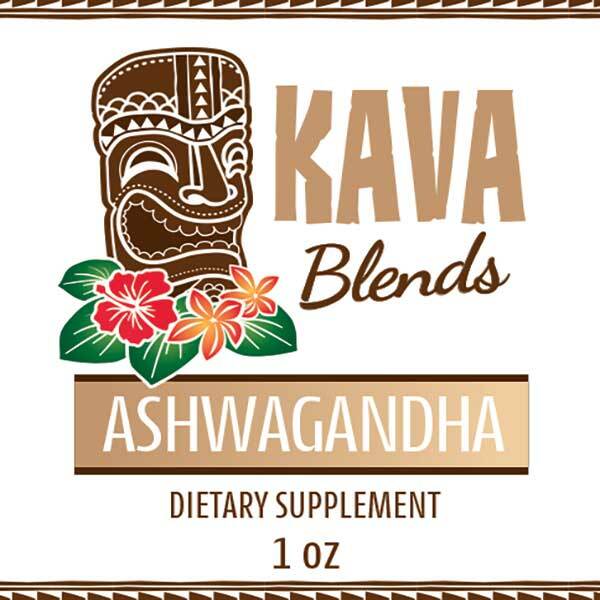 This Happy Kava Brand Ashwagandha Kava Tincture Blend is not intended to cure, treat, diagnose, or prevent any disease. I believed that both Kava and Ashwaganda were tonic herbs or adaptogens and couple be taken daily. I know that herbs such as echinacea must be taken short term and then stopped for a bit…..would you explain the science or though process on needing to take a couple of weeks off from taking the Kava/ashwagandha blend? Is is because of the alchohol base? Thank you for your question Michele. Two week break is recommended as a tolerance break and it is recommended by the FDA. There are a lot of information regarding this theme online and you are welcome to read more about it. If there is anything else we can help you with, please let us know.